This book is designed for easy learning. 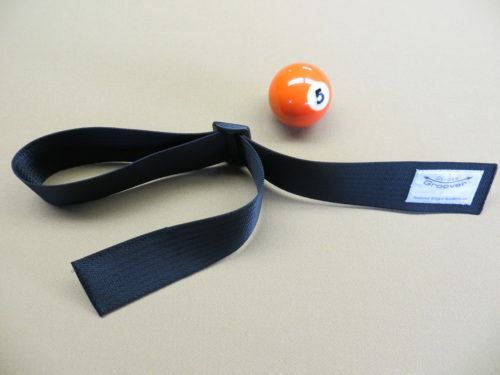 These are the billiard instructional articles I wrote for national pool magazines over the course of 15 years. Each lesson is just one page, and there are 129 lessons. That’s just 28¢ per lesson. * Please note that my cover photo is intended to be humorous. I haven’t actually clubbed anyone lately. 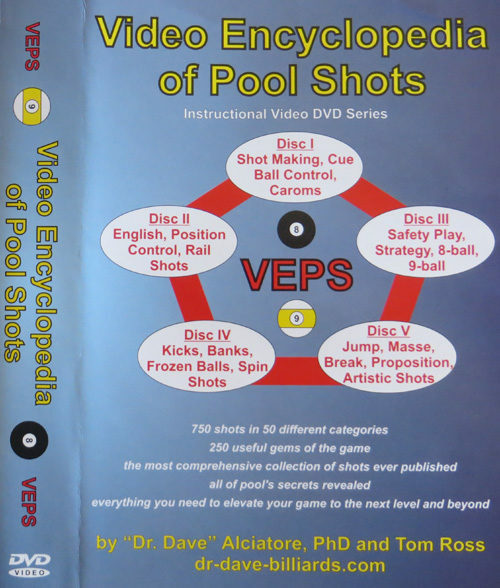 Professional Billiard Instructor & Author Matt Sherman loves the book. 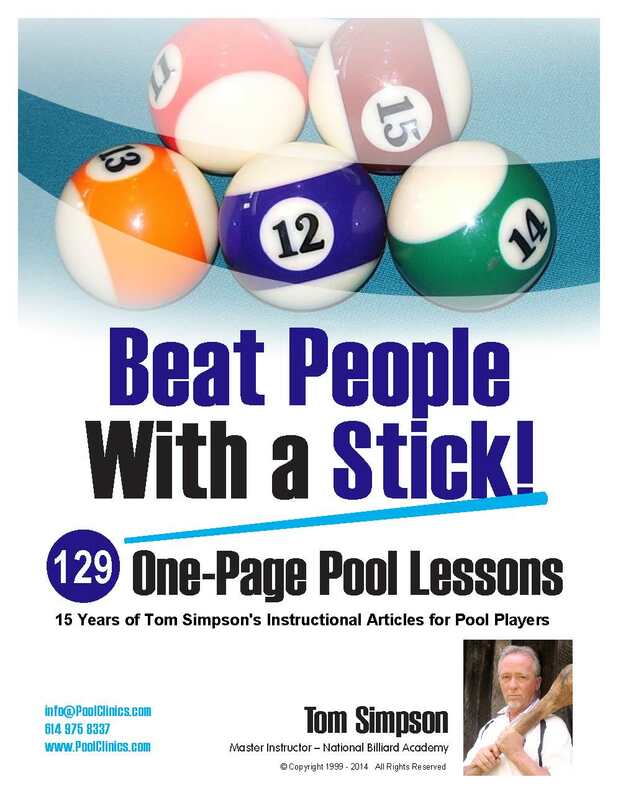 Pool & Billiard Magazine Editor Tom Shaw reviews Beat People With a Stick! 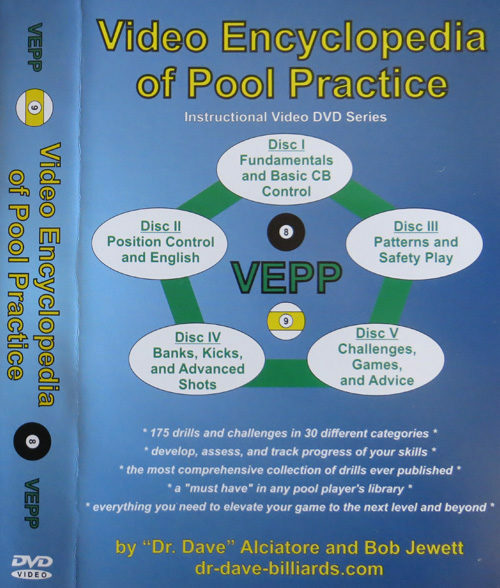 “Simpson, a long time Master Instructor and founder of the National Billiard Academy, has compiled ten years of instructional articles in a full page, spiral bound softcover book. There aren’t many diagrams, and only the cover is in color, but those things don’t matter; content is king, and there is lots of very useful teaching in these pages. As might be expected, subject matter jumps around from page to page, but there’s a table of contents and the clever article titles tell you what they’re about. It will be very hard not to mark up this book, using a high-lighter type pen, stars, lines with exclamation points on the end, and the like. One gem of advice or insight after another makes it impossible not to want to find and refer to them again. And there are multiple articles on single topics; if one method of jumping doesn’t appeal to you, there’s another, and so on. On other topics Simpson makes it clear there is a right way – and maybe a bunch of other wrong ways. Billiard University co-founder Dr. Randy Russell comments on Beat People With a Stick! You know from experience how valuable a good pool tip can be. This book has HUNDREDS of good tips & useful insights. You’ve probably read a few of my columns already. Now you can have the entire collection, neatly organized and spiral-bound for ease of use at the table.